ECN Trading accounts are trading accounts in which a computerized forum or network is used to trade stocks or currencies outside traditional stock markets. ECN stands for Electronic Communication Networks. When you are using a broker which haves your order executed on a stock exchange like Nasdaq or DAX, the broker has to pay a fee to the stock exchange which they charge you for. To trade the market in a cheaper way, that is: lower commissions (spreads) you can choose to trade with an ECN account. ECN account trading is also referred to as ‘direct accesss trading’. After entering the order in the system of the ECN Broker, the computer system of the broker then will match contra-side orders for execution. When their is no corresponding order, your order will be posted to the system to be visible to other ECN traders. 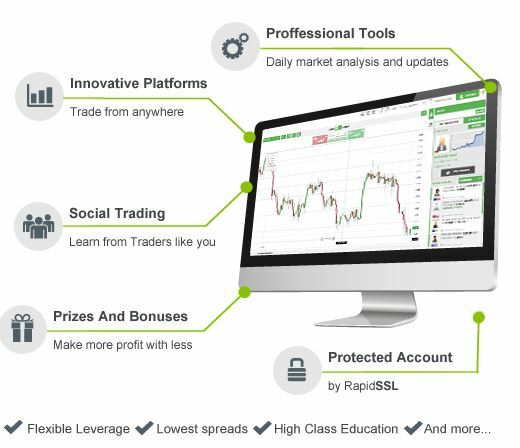 Anonymous trading – ECN trading is anonymous trading. Being anonymous in the financial market enables traders to deal prices neutrally, which reflects the real market conditions and is not based on current marketpositions, strategies and so on. Instant Execution – When the ECN trader hits the ‘execute’ button in the ECN trading platform, the order is executed immediately. Common stock brokers usually have a delay of a few (micro)seconds in executing the order in which the rate you were able to buy/sell the asset at has changed a little (slippage). Client to Bank Trading – Not only trading with other traders, also trade with the world’s biggest financial institutions and world-class banks. Low Spreads – On an ECN trading account, the trader has direct access to the real time market prices. These market prices can fluctuate and they reflect the supply and demand, volatility and a lot more conditions changing the market prices. Spreads are almost always ranging from 0.1 pip to 0.8 pip. The benefits of Neto Trade’s ECN trading Account. Click to Enlarge.